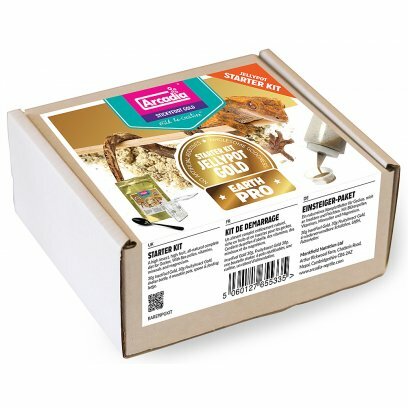 EarthPro-InsectFuelGold ?Gutloader? 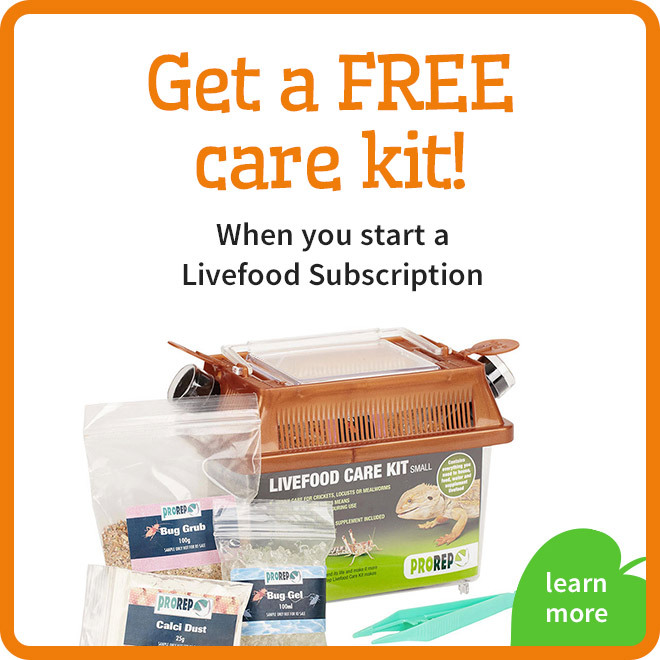 will allow you to both feed and hydrate your feeder insects effectively and safely. 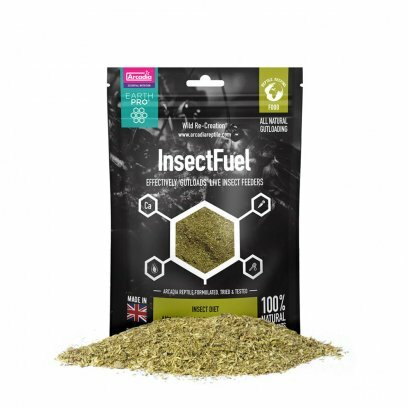 Using our ever popular ?InsectFuel? recipe as the base of a fun to make Jelly pot. Simply make up the jelly to Gutload and Hydrate your feeders before they are fed to your pet. Contains; Alfalfa, Calcium Carbonate, Dandelion Leaf, Locust Bean Gum, Carrot, Spinach, Potato Protein, Dextrose, Mineral Powder, Papaya, Spirulina, Bee Pollen. 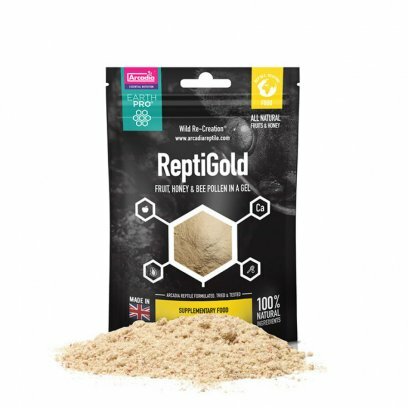 Arcadia Reptile EarthPro CustodianFuel is a full spectrum, easy to use and potent way to feed the Micro-fauna that live and work inside of a Bio-Active enclosure. 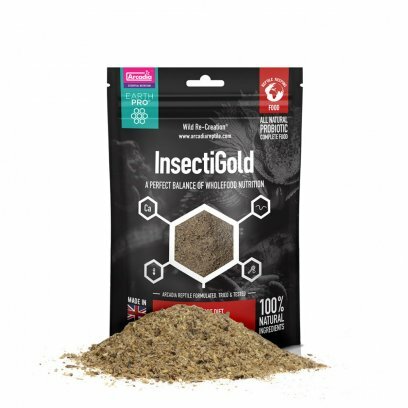 It includes 9 of the very finest quality ingredients that when mixed together will help to supply all of the key nutrients that springtails, woodlice, beetles, millipedes and other micro-fauna need to grow and to reproduce. Also included is a high level of calcium in the mix so that these custodians are a good source of nutrition in their own right. Feeding your custodians is an essential process that is often overlooked. If you wish to maintain Wild Re-Creation through Bio-Activity then having a potent live system of diverse Micro-fauna is essential. Simply press one UK made pellet into the soil every 1"/2.5cm every 2 weeks or as required. The custodians will then find the pellets and consume them. Arcadia EarthPro CustodianFuel offers a simple to use and accurate method of feeding your ?system?. As such we are sure that you will see the positive effects very quickly. Packed in an easy to use and re-sealable foil pack for lasting freshness. 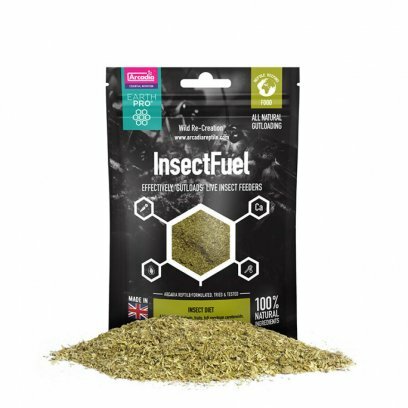 EarthPro InsectFuel is a potent and highly effective insect food. This food can be used to fill feeder insects of all species full of goodness that can then be passed onto the predator. 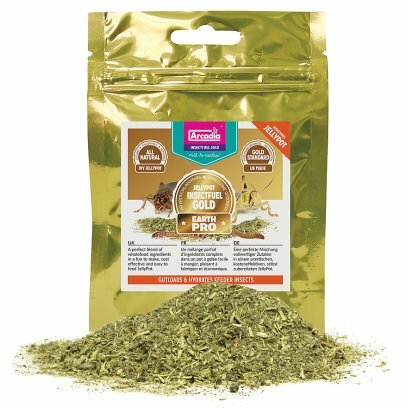 It is based on UK grown Alfalfa which is highly palatable to insects. We have also included full spectrum vitamins and minerals, Bee pollen and a high potency marine carotenoid to provide vitamin A in a safe and regulated way. Guaranteed effectiveness! 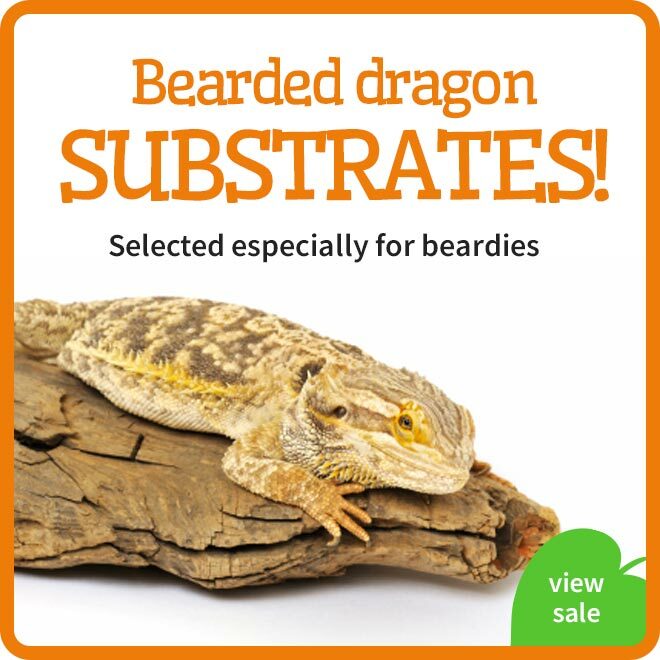 Can be used with all feeder insects and pet species. Can also be used as a dietary supplement for herbivorous species. 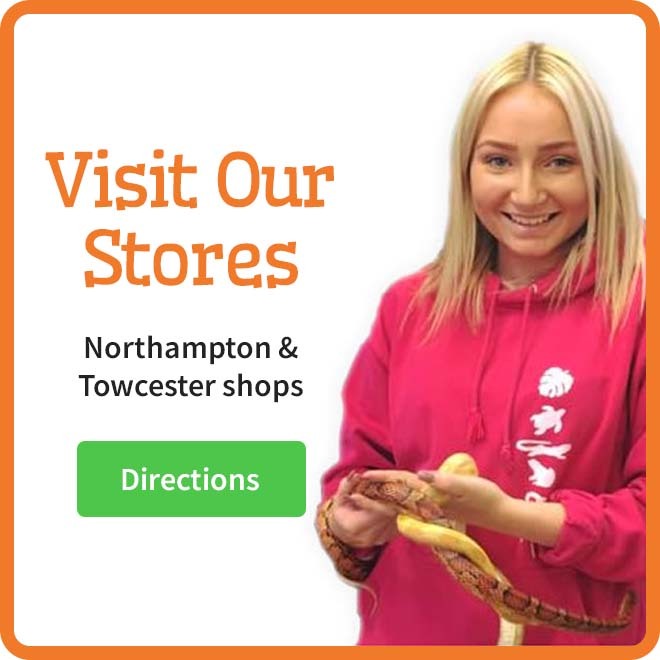 EarthPro-A is a potent dietary supplement that will help to supply all of the essential vitamins and minerals that a captive exotic needs in a safe and natural way. 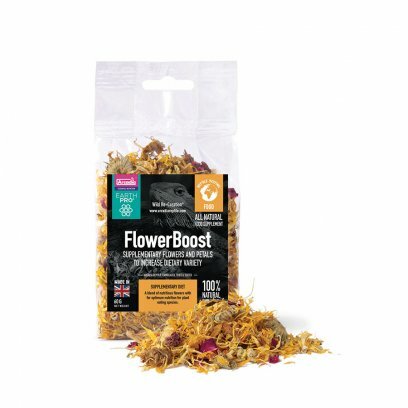 Potent Carotenoids and bee Pollen are used to cater safely for vitamin A and to aid digestion and growth. The product contains zero synthetics that can be easily over or under dosed. EarthPro-CalciumPro- Mg is supercharged with Magnesium for optimum bone, blood and nerve health, no other plain Calcium powder can compare. 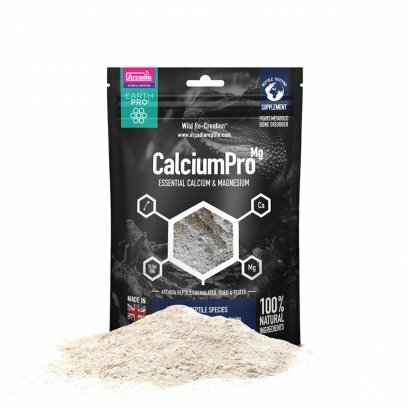 EarthPro-CalciumPro- Mg Has been developed to be used safely to replace sole sources of Calcium and can be fed at will. By changing your feeding cycle to include a balanced inclusion of magnesium you will help to ensure strong, firm bones, which helps to 'Eliminate MBD'. Magnesium is a 'Supercharger' within the Calcium assimilation, storage and use cycles. Magnesium is one of the vital ?keys? to accurate Calcium provision. Magnesium is stored within the bones and helps to regulate healthy Calcium storage. 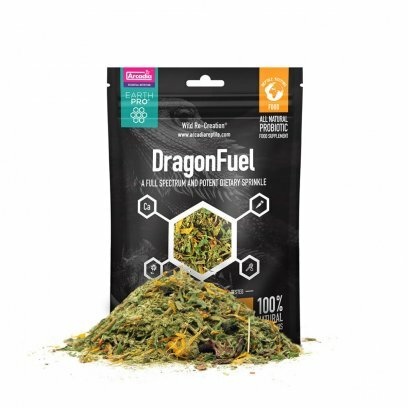 It also works alone as a critical agent with hundreds of other vital biological enzymes to help regulate nerve and muscle function, protein synthesis, blood pressure, blood glucose levels and plays a very useful role within the digestive system. Ingredients: Calcium Carbonate, Magnesium Carbonate. 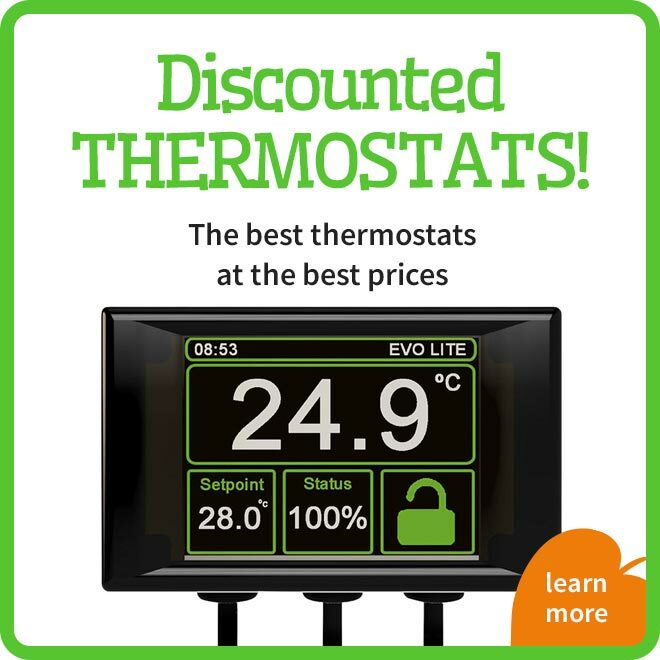 Usage: Dust on to Livefoods, Green foods and Defrosted items at every feed. Dust Livefoods in Livefood containers and target feed for best results. 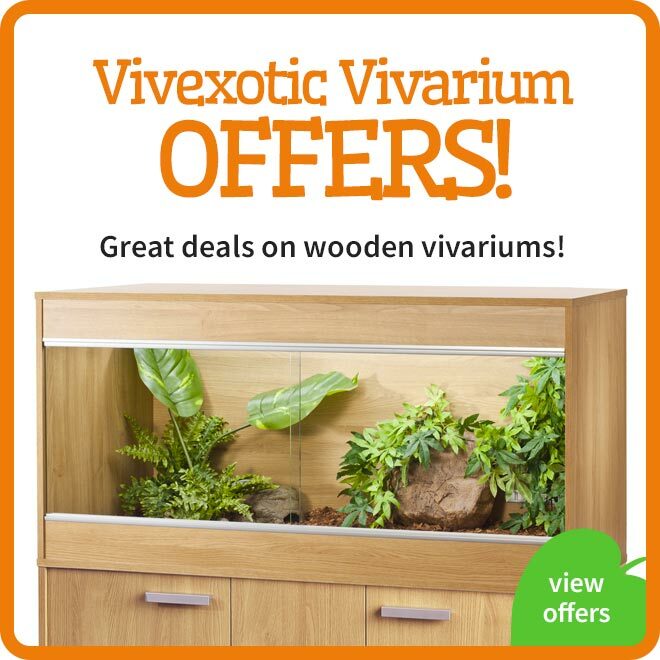 Can be left in a dish inside of the enclosure as with any other Calcium powder. 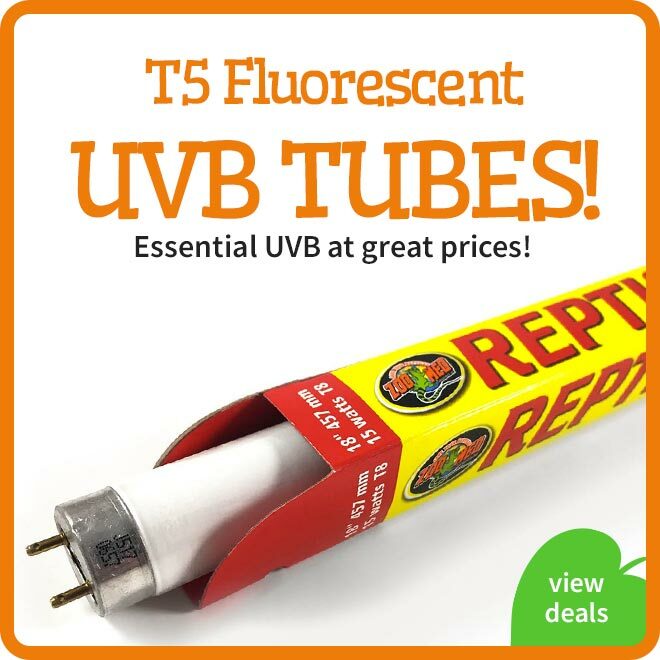 Should be used alongside EarthPro-A and with a suitable UVB system. Calcium is one of the most plentiful elements on earth. It is responsible not only for maintaining strong bones but is essential for vital organ function. 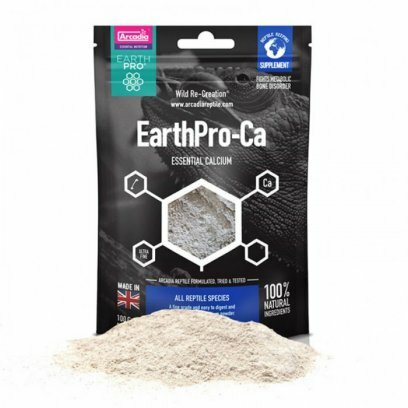 EarthProCa can be used alongside the EarthPro-A supplement and EarthPro InsectFuel. 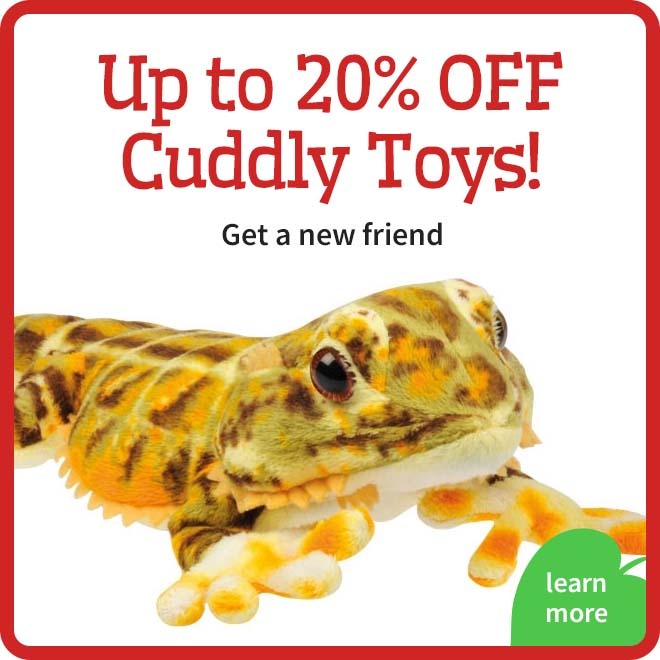 EarthPro-AmphibiGold is a totally reformulated, 'Wild-like' and wholly natural small pelleted diet for Amphibians including Axolotls, Clawed frogs, Newts and Salamanders. 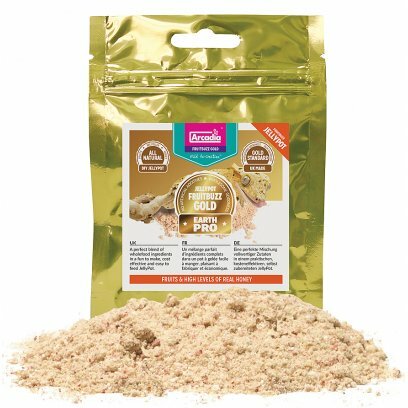 This easy to feed diet is made from a wealth of all natural ingredients including; 60%+ invert and fish protein from Freshwater fish meal, Earth worms, Snails, Bloodworm, Brine shrimp, Daphnia, plants and a natural probiotic. Feeding these animals in water or on land has never been so easy. 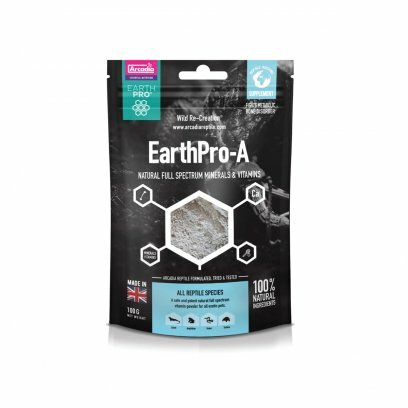 EarthPro-AmphibiGold not only seeks to replicate those food items commonly found in the wild but it also contains essential Vitamin A and D3 from a natural fish source. As such and without using synthetics we are able to provide these vital nutrients in one of the ways that they are obtained in the wild by this group. EarthPro-AmphibiGold really is the ?Gold? standard in pelleted Amphibian food. Salmon Fish Meal, Insect Meal (Krill, Bloodworm, Earthworm, Daphnia, Brine Shrimp, Snail), Soya, Spirulina, Calcium, Brewer?s Yeast, Di-Calcium Phosphate, Paprika, Pro-Biotic. Crude Protein 45%, Crude Fats & Oils 7%, Crude Fibres 2%, Crude Ash 11%. 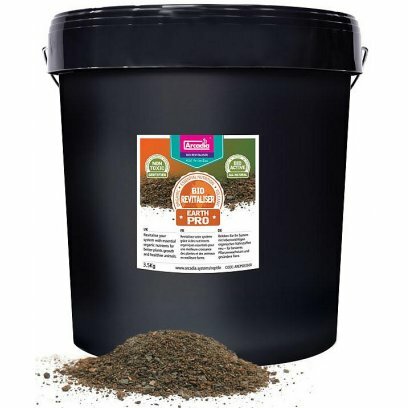 Available in a 3.5kg re-sealing bucket. 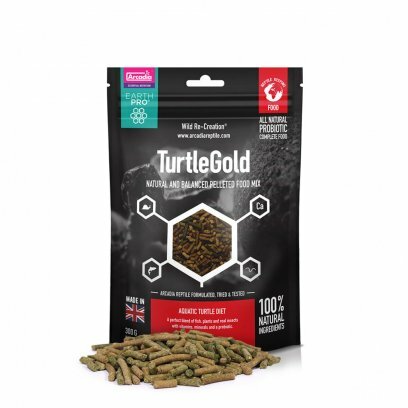 EarthPro-TurtleGold contains a wealth of ingredients to help cater for your Turtles nutritional needs. Snails, Earthworms, Daphnia, Bloodworm, Shrimp, Plants, Minerals and Vitamins and a Probiotic. EarthPro-TurtleGold is the ?Gold Standard? in Aquatic Turtle care. EarthPro-TurtleGold is an all-natural and balanced pelleted food mix for all aquatic Turtles. 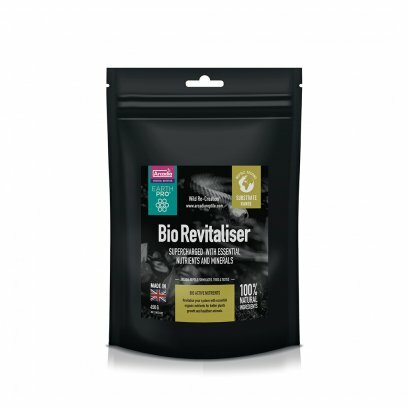 Formulated and made in the UK to the highest possible standards, these nutrient rich pellets contain the correct balance of, Fish, Shrimp, Insects, Aquatic invertebrates, Essential plant matter, Snails, Earthworms, Vitamins, Natural full spectrum minerals, Essential oils/fats, Flaxseed (a fantastic source of ALA) and a Probiotic. 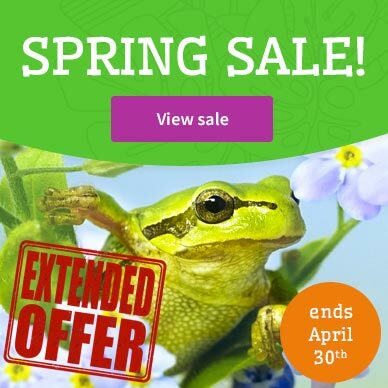 EarthPro-TurtleGold can be used alongside other plant and Livefoods to offer fantastic nutrition, dietary variety and enrichment. 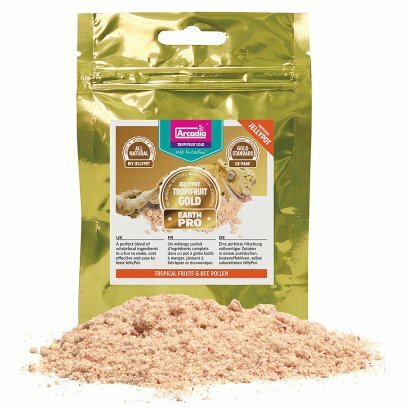 EarthPro-Turtle Gold contains whole fish meal and algae, well known to help provide vitamins A and E and should be used alongside a well appointed UVB source. 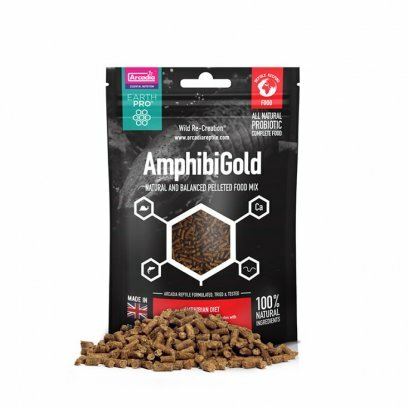 These pellets have been designed to be both attractive and palatable and will sink to allow bottom feeding species including Musk Turtles to feed in a natural way. 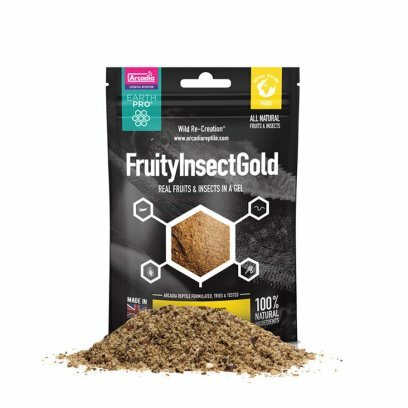 Ingredients: Wheat, Salmon Fishmeal, Soya, Calcium, Shrimp, Silkworm, Alfalfa, Mineral Clay, White fishmeal, Flax seed meal, Mealworm, Green Pea, Spinach, Krill, Daphnia, Carrot, Potato Protein, Spirulina, Seaweed, Brewer?s Yeast, Earthworm, Snail, Bloodworm, Dandelion, Celery, Broccoli, DiCalcium Phosphate, Pro-Biotic. Usage: Feed as required per species and size of turtle. 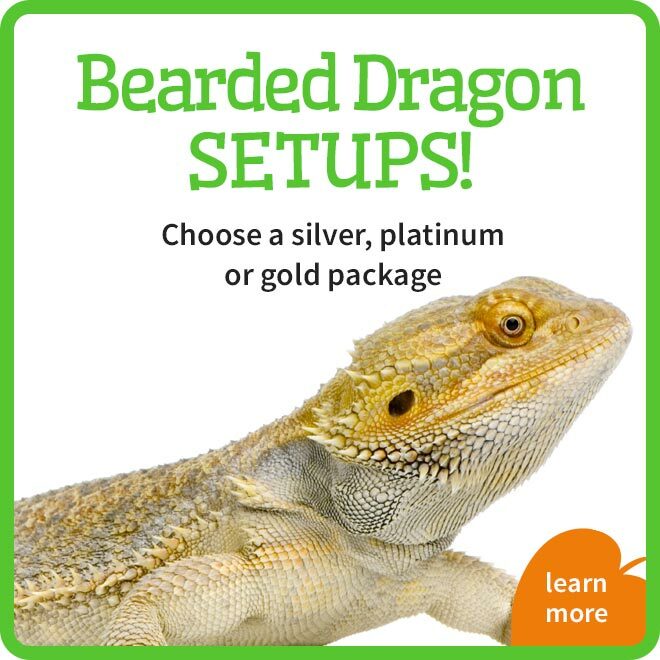 Use alongside a well-appointed heat and UVB system. Ensure adequate filtration. 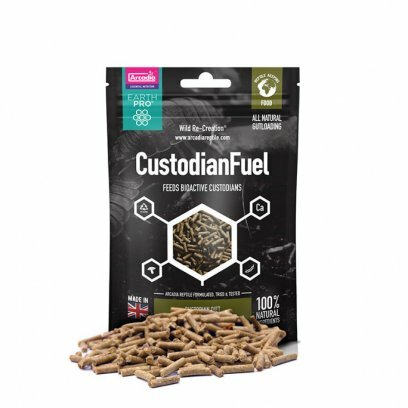 Feed as much as can be consumed in 5 minutes and remove any uneaten pellets. Feed as part of a full and varied diet. 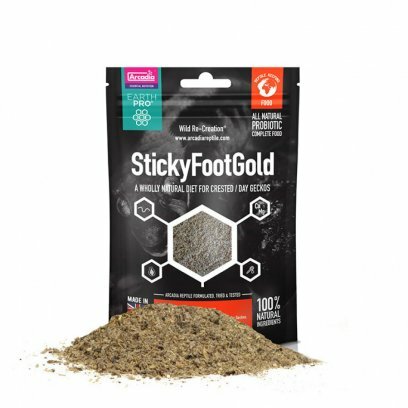 Aquatic Livefoods can be added to increase variety and to provide natural mental and physical enrichment.